Sometimes in life you have to take a chance on something amazing in hopes that it works out. 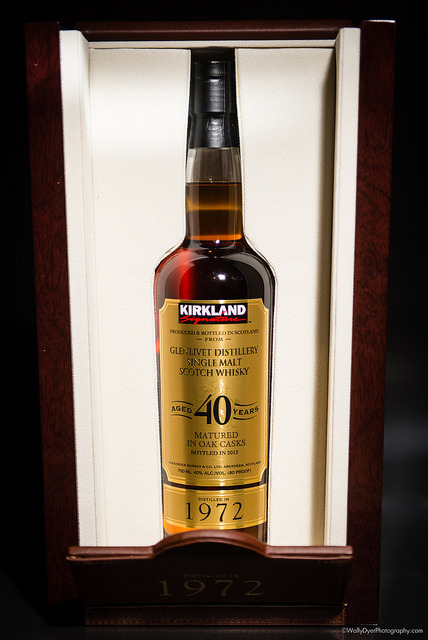 This bottle of Glenlivet 40 (bottled by Alexander Murray & Co, sold by Costco under the Kirkland brand name) is that chance that we wanted to take. Having spoken to a few other scotch loving gentlemen it would seem there are two schools of thought on a bottle like this. The first school of thought only cares about what’s in the bottle and the actual scotch itself. A rose by any other name would smell just as sweet and a scotch in any other bottle is still the same delicious dram. At ScotchNSniff, we’ve chosen to follow the first school of thought. The one that doesn’t judge a scotch by it’s color or bottle or packaging or name. With all of that said, let’s review this beauty. COLOR: Darkened Caramel, ironically Kirkland’s 18 looks exactly the same but that is where their similarities end! NOSE: Sweet oak, cherries, no alcoholic bite, refined, mellow is an awesome word to describe it, creamy sweet fruits, sweet cream, I can’t speak enough to how sweet it smells, baked apples like in apple pie, my normal trick of inhaling the nose across the palate doesn’t work with an alcohol this subdued, on to the palate! FINISH: smooth as a baby’s bottom and as light as a cloud in the sky, this creamy dram is so ridiculously smooth on the palate, coating the tongue like butter without any oily feel, I need a second bottle to save for retirement! I feel wrong adding water but it’s a part of our process so I’ll do this exactly once. This scotch needs no water. FINISH: the smallest touch of smoke to remind you that you’re enjoying a fantastic scotch, I can see what all the fuss is about over this bottling. So… is it worth $700? If you’re an experienced scotch taster (we’ll say you’ve had at least two dozen scotches for comparison), the answer is a SOLID YES. For us, this was a one time purchase that might turn into a two times purchase! If you’re NOT an experienced scotch taster (as tested by our PR advisor), it might be worth passing up. Not that your palate has to be super refined but it helps to have a few different points of reference.